Think you have what it takes to soar with Eagles Baseball? We’re looking for a couple of 9U players to round out our 2015 spring team. Individual evaluations are now being held at Professional Baseball Instruction’s indoor facility in Upper Saddle River NJ. Players must be 9 or younger as of April 30, 2015. Need more information? Call PBI TOLL FREE at 800-282-4638. Kevin Ferguson joined Eagles Baseball as a player when he was just 11 years old. Following a stellar high school career at St. Joseph’s Regional High School in Montvale, and playing on the college level at Northeastern University, Kevin was signed by the Houston Astros and is currently in their extended spring training. Check out this footage of Kevin throwing a bullpen this winter at Professional Baseball Instruction. 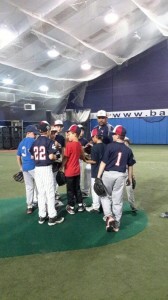 Kevin also worked with our current Eagles players this past winter as an instructor at PBI.